This dessert needs at least 3 hours to chill before serving. This recipe requires whipped cream for 3 out of the 4 layers of the dessert. I like to use real whip cream for all of my desserts, so for this recipe I used a 1L container of heavy cream and whipped it up so it was ready to use when I needed it. In a mixer combine the chopped nuts, flour, sugar and butter. Press the nut mixture into the baking dish. Bake for about 15 minutes. Don’t overcook it or the crust will be too hard. Once the crust is done baking, set it aside and let it cool completely. Using a mixer, cream together the cream cheese and icing sugar until smooth. Add the 1 cup of whipped cream and mix. Transfer to another bowl, and set aside. Using a mixer cream together the milk and pudding mix until smooth. Add the pumpkin puree, spices and whipped cream. Mix completely. Once the crust is cooled, spread on the cream cheese layer. 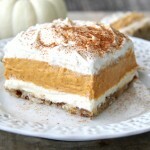 Then spread on the pumpkin fluff layer. Spread on the remaining whipped cream. Garnish with chopped pecans or dust with ground cinnamon. Chill for at least 3 hours, or overnight is best. This recipe requires using a mixer for each layer, but don’t worry, you don’t need to clean the mixer between each step.